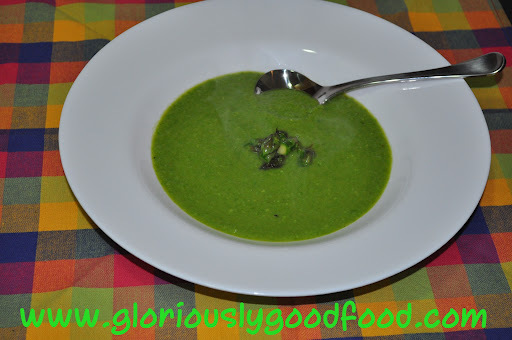 This is one of the simplest soup recipes and one that everyone I’ve made it for absolutely raves about! Sometimes the simplest recipes really are the best…and this one is truly, gloriously good (even if I do say so myself)! Chop the asparagus spears into approximately 1cm lengths, but keep the pointy ends plus maybe one or two extra cuts’ worth separate to use later. Melt 30g of butter in a medium/large stockpot, then add the bulk of the chopped asparagus (NOT the ends you’ve reserved on one side!) and turn the heat up. Add salt to taste and stir. After about a minute or so, add the frozen peas, stir and grate in a sprinkling of fresh nutmeg. Cover with boiling water (only to about 1cm above the solid ingredients). Bring to the boil and boil until peas and asparagus are cooked (approx. 5 mins); the softer the peas, the smoother the soup, so this is down to personal preference how long you cook it for. Taste the stock during the cooking process and add either salt or another stock cube/pot (or part of one) if it requires more seasoning. In a separate pan, fry off the asparagus tips you previously kept aside in the remaining butter and season with salt (to taste). They need to be cooked but still crunchy, so you only need to fry them off for 1-2 minutes. 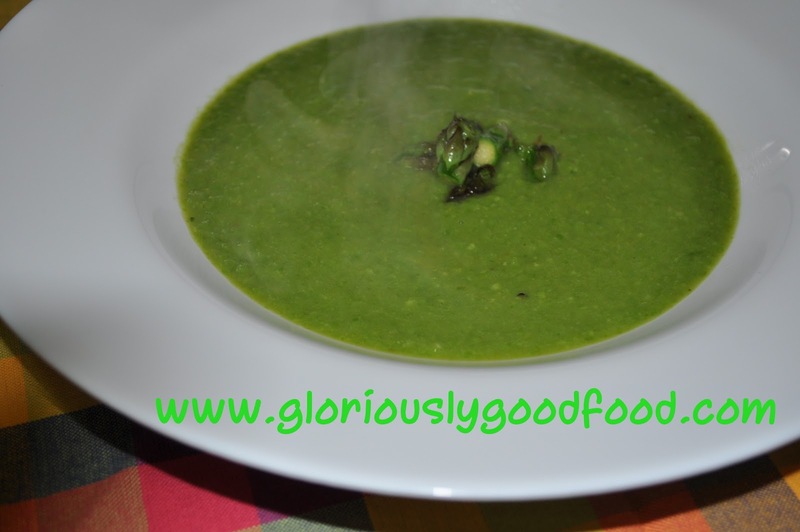 Stir the fried asparagus tips into the soup. Serve & enjoy – Gloriously Good Food! a quick and healthy Low-Cal lunch or a tasty side-dish! Serves: 4 as a side-dish or 1-2 as a healthy low-cal lunch! Tip: The key to this quick & delicious courgette / zucchini lunch or side-dish is to use a good non-stick frying pan and keep the heat on high! That way, the courgettes / zucchini don’t stick (despite use of very little oil) and you get that beautiful caramelised taste, texture & look. After all, who wants anaemic-looking courgettes/zucchini on their plate?? Then cut each length into approx. 1-1.5cm chunks – don’t worry about this looking too precise or pretty. I put 4 lengths together and cut them all at once, quite quickly & roughly. This is a QUICK recipe! 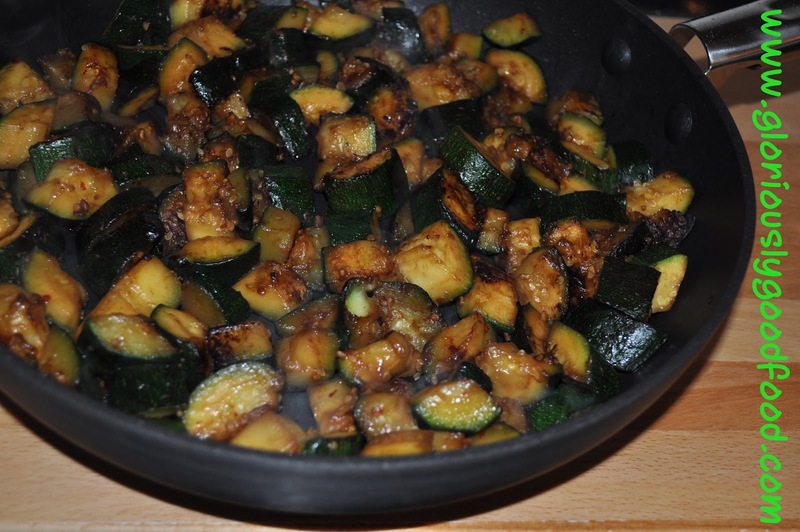 Heat the oil in the frying pan and when it’s really hot & sizzling, add the courgettes / zucchini. Season to taste with salt, garlic powder (or dried chopped garlic) and chilli flakes. Stir occasionally to ensure they caramelise evenly, keeping the heat on high at all times. After approx. 10 mins, they’re ready to serve (or longer if you prefer them softer). Why not beat some eggs and pour them over the courgettes / zucchini once they’ve browned off nicely, to turn this dish into a tasty omelette? 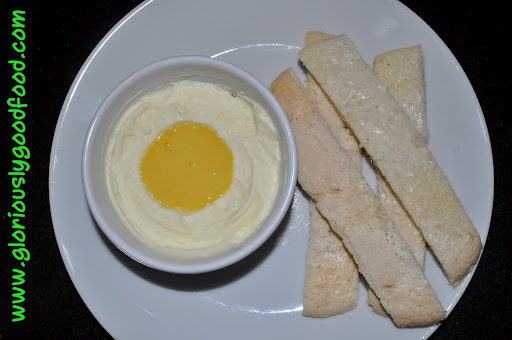 *Crema Pasticcera (also known as Crema Inglese or Crème Patissière or Crème Anglaise) is essentially custard…delicious, home-made, easy to make and rich-tasting custard! First of all, make the Savoiardi biscuits as per my recipe, but ensure you SUBSTITUTE THE FOLLOWING: Instead of using vanilla essence, use the finely-grated rind of half a lemon (ideally an unwaxed lemon). Note: If you are short on time, you can use shop-bought Sponge Fingers. Distribute the white chocolate mixture into 6 small bowls and smooth the surface as much as you can using the back of a teaspoon, then clean around the edges of the bowl with a clean teatowel or kitchen tissue paper. Place the 6 bowls in the fridge to set. Return the mixture to the pan, add the food colouring and, over a low heat and while stirring with a spatula/spoon or hand-held whisk (using a whisk is a good method to avoid lumps, but use it to STIR rather than whisk! 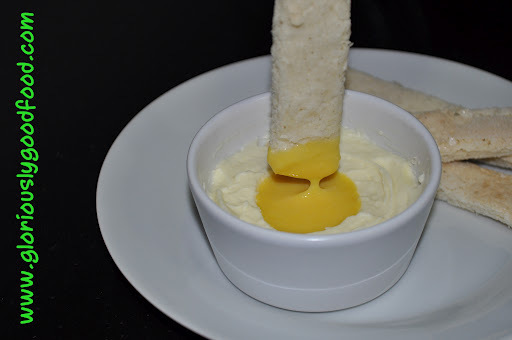 ), heat it until it thickens to a rich thick custard. Ensure you stir continuously!